at 57 N Street Northwest, Washington. The development was completed in 2018. Sales for available units range in price from $449,900 to $1,100,000. Chapman Stables has a total of 114 units. Sizes range from 640 to 1382 square feet. Open house January 19th, 20th and 26th from 12pm-4pm. At Chapman Stables, you can embrace a new style of historic living. Here, modern amenities and thoughtful details enhance the industrial spirit of a building that dates back to 1906. With its roots in America's Industrial Age, the Chapman Coal Company Garage and Stable has long been an architectural icon. 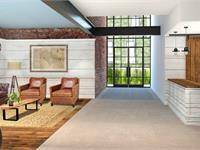 In its next chapter as Chapman Stables, the building's soul has been restored with architectural details that evoke its storied past, as well as thoughtful 21st-century amenities that make it the ultimate in old-meets-new. Your inquiry will be delivered to the Chapman Stables sales team, who will send you more information about this development.